South to West Panorama from Palomar Mountain-FOG over the coastal areas. PALA, PALOMAR MOUNTAIN, & JULIAN! On our 46th Wedding Anniversary we decided to take a day trip to where ever the roads might lead us. We were rediscovering areas we hadn’t been to in over 35 years. 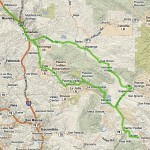 Our only plan was to head towards Palomar Mountain and the observatory and then just see where the roads might take us. After leaving 1-15 we drove through the scenic back roads of the Temecula Valley to Pala. Along the way we passed the Pechanga Indian Reservation and Casino then the Pala Indian Reservation and Casino in Pala before heading south on SR-76. We headed towards the turnoff road to Palomar Mountain passing through many orange groves, orchards, and plant nurseries. Continuing on we passed the Pauma, Rincon, and San Pasqual Indian Reservations all sporting large signs trying to entice passing travelers to drop in and gamble a while or enjoy their fine buffets. We also passed the La Jolla Indian Reservation which did not have a casino yet, but they have a plan for one. The Mesa Grande and Los Coyotes Indian Reservations were also passed during our day trip but all they had to offer were campgrounds. The last three Indian Reservations were the most isolated from population centers as you as you might have guessed. The size of the casino, largest to the smallest, was also reflected by their relative distance from population centers. Pechanga was the largest casino, Pala coming in second, and the remaining casinos diminishing in size as the distance from customers increased. The traffic also diminished as we passed the last several casinos. By the time we reached the Palomar turnoff the traffic was light, but that was all about to change. Reaching the turnoff road to Palomar Mountain Judy noticed a sign indicating that Julian, CA was only 33 miles away. 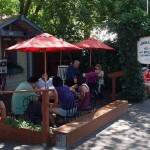 She stated the she would love to go to Julian recalling it as one of her favorite places. We used to camp at Anza Borrego State Park and when returning home from Anza Borrego we would occasionally travel through Julian on our way home from camping. I said we probably had time but let’s check out the mountain first. As we started up the mountain we began picking up more and more motorcycle traffic traveling in both directions. We also noticed that this road had the largest concentrated number of California Highway Patrol (CHP) units that we had seen anywhere since our arrival in SoCal. The very windy road to the top of the mountain apparently is a favorite of daredevil motorcyclists speeding up and down the mountain as fast as they can while hoping not to go over the edge or hitting something. Using the turnouts to let the daredevils pass and staying away from the daredevils descending the mountain, while slowing where the CHP was ticketing or investigating a daredevil violation or accident we made it to the top of the mountain. Up over the ridge and heading towards the Palomar Observatory we passed Mother’s Kitchen Restaurant where 100’s of motorcyclists were enjoying food and beverage. We continued on to the observatory. 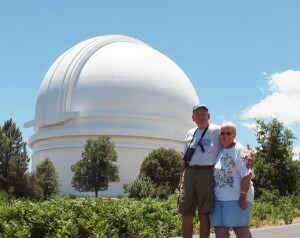 It was quite warm and a long walk for Judy but she made it to the observatory. She was however disappointed that she wasn’t able to climb the stairs within the observatory to the telescope. I made a quick trip up the stairs and returned advising Judy that she didn’t miss anything. She thought there was a great view of the landscape from the observatory but I told her that all you could see was the telescope itself and that was from behind a glass barrier. We left the observatory and headed back passing Mother’s Kitchen Restaurant just as a large number of bikers were about to make their run down the mountain. At the intersection we chose to head south atop the mountain rather than compete with the motorcyclists on their downhill run. So we headed south to Lake Henshaw (17 miles away) and heading towards Julian. The road not being as challenging (lacking the many tight curves and turns) for the motorcyclist’s was a pleasure as we descended down the mountain. We reached the bottom and a junction with no signage. My guess was to turn left and soon we reached a junction that pointed to Julian just 7 miles away. We arrived in Julian (population 1650, elevation 4,230 feet), a small mountain town famous for its apple orchards and apple pies. We hadn’t yet had lunch and it was already 2 PM, but Judy mentioned Apple Pie and I listened. After finally finding a parking place we walked to the Julian Pie Company and entered. Judy remarked that we should probably have lunch before pie. I responded by explaining that there was no way that I would be able to have lunch and then a piece of pie. We both chose pie a-la-mode for lunch and we weren’t disappointed. CLICK again when single image appears for the full-size image. Judy selected the Apple Pie a-la-mode, and I selected the Apple Mountain Berry Crumb Pie a-la-mode. The large portions made for a sweet lunch meal indeed. The pies were delicious and once Judy discovered the taste of my pie her fork kept missing her own plate and landing in mine. Judy’s fork never left my plate without a morsel of my pie. She did continually offer, “Would you like to try some of mine?” Eventually running out of my own pie, I succumbed. The Apple Pie was quite good as well, especially the crust. With our bellies full we left Julian and headed back towards home. We chose SR-79 to return home passing through Warner Hot Springs and the location of the Los Coyotes Indian Reservation, the largest Indian Reservation in San Diego County with more than 25,000 acres which includes Hot Spring’s Mountain (6,533 feet), the highest mountain in San Diego County. 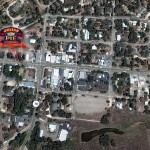 SR-79 took us rapidly through Oak Grove, population 100. A sign placed below the official highway town sign states that the community is home for 97 pleasant people, and 2 or 3 grouches. Oak Grove also has one of the few remaining Butterfield Stagecoach Line stops. The stagecoach line ran from Fort Smith, Arkansas running through the southwest and ending in San Francisco. The Butterfield Stagecoach Line operated in the late 1850’s to the early 1860’s and was an early venture of American Express and Wells Fargo. This little narrative took more than 1,000 times longer to write or read than it took to actually pass through Oak Grove. We arrived home from our Anniversary Road Trip both fulfilled from a wonderful day and a wonderful treat at the Julian Pie Company. After resting up a little we topped off the day with a nice relaxing dinner at the Outback Steakhouse. 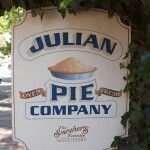 We have since learned that we can purchase Julian Pie Company’s pies at our local grocery store, delivered daily. But, Julian really isn’t all that far away and for some reason I think it probably would taste much better in Julian, than here . . . . . but maybe not, we will give it a test soon! VELCRO is doing fine, but not being included in the Anniversary Day Trip he has been giving us the cold shoulder for leaving him home alone for the day.